June Favourites | Becky Alyssa's Beauty Box. It’s almost July already! And summer is already in full swing: the weather on the South Coast has been glorious; even a little hot at times! 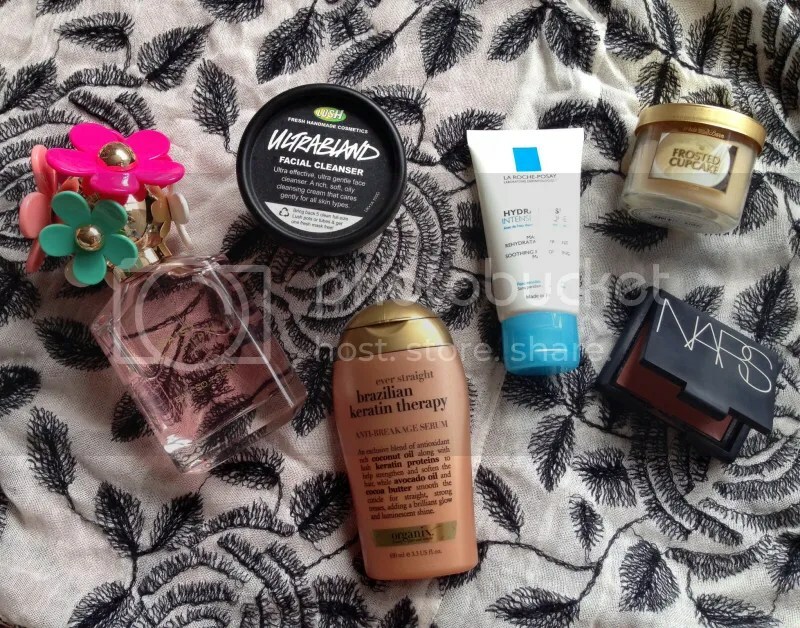 Here are some of the warm weather-friendly products I’ve been loving this month..
1. Marc Jacobs Daisy Eau So Fresh Delight EDT (£44.20 via Escentual) – Do you recognise this from my birthday wishlist? I ended up getting this as a gift to myself (including some much-wanted Topshop clothes) since I couldn’t get it out of my head. I’d sampled it a couple of times before and fallen in love – Marc Jacobs can do no wrong with fragrances. It does smell like an expensive fruit cocktail with a decadant touch of floral – something that I can definitely get into. Undoubtedly an extravagant purchase, but it is so wearable in summer weather, and the bottle looks so gorgeous on the dressing table. In love. 2. Lush Ultrabland Facial Cleanser (£6.95 via Lush) – Cleansing balms are a huge deal in the beauty world lately, and Ultrabland is my personal favourite. The simple, natural formula gives the most gentle yet effective cleanse, removing dirt and makeup easily – ideal for sensitive skin. I’ve been using this every day for the last couple of weeks and my skin feels more calm than ever (not to mention so soft afterwards thanks to the almond oil). I’ve heard fairly good things about other (significantly more expensive) cleansing balms, but who needs them when Ultrabland does such a great job for a fraction of the price? 3. La Roche Posay Hydraphase Intense Masque (£10.66 via Feel Unique) – Anyone notice I kind of love French skincare brands lately? The simple, bland formulas soothe my sensitive skin and do exactly what they claim without a hint of irritation. The Hydraphase mask came in particularly useful when I got caught outdoors in the sun whilst catching up with a friend for longer than I thought (clearly SPF 15 isn’t enough for my paleness!) and I was left with mild but very sore and uncomfortable sunburn. My Avene Eau Thermale helped a little, but wasn’t quite enough to stop the chronic pain. The next day, I used this mask and it did wonders to cool, soothe and rehydrate my skin, as well as making it look less red. This would be ideal for anyone with dry or combination skin – a simple, truly hydrating mask without the extra unnecessary ingredients. A summer essential! 4. Bath & Body Works Frosted Cupcake Mini Candle ($3 – 4.50 via Bath & Body Works) – I still harbour a full-on obsession with Bath and Body Works candles, remaning amazed at how such brilliant and beloved cult products still haven’t made it to the UK (not officially of course – you can sometimes get them on Ebay if you’re willing to pay significantly more than RRP). Even these little mini candles smell incredible with an excellent throw – no obviously synthetic heave-inducing scents over here. I bought Frosted Cupcake from one of their outlet stores in the US last year and have only just got round to burning it. Glad I did, because it smells amazing – like a bakery full of freshly made vanilla cupcakes, without being sickly or overpowering. Perfect for getting comfortable in the evening and binge-watching some Orange Is The New Black! 5. Organix Brazilian Keratin Therapy Anti-Breakage Serum (£4.66 via Superdrug) – After 2 years of having this lying around and previously considering tossing it, I’m so glad I gave it another chance! I’d bought it long ago to combat the horrible frizzy-ness that the weird humidity of September / October on the South Coast brings, and worked pretty well to keep it under control. Usually I rub some Moroccan Oil into my ends to keep them looking healthy and smooth, but my hair had got used to it after so much use. I decided to give this a go on a whim and was amazed at the results! After washing, my hair is so sleek, smooth and shiny without being greasy – soft and touchable without being fluffy. It looks like I just had an expensive treatment done, but it’s only a 5p-size blob of this worked through the length of my hair after every wash. Since you only need such a tiny amount, I consider this little bottle to be great value and worth a try to anyone in need of a frizz-proof post-wash serum or treatment. 6. NARS Penny Lane Cream Blush (previously £21.50 via Space NK) – I have a horrible feeling this shade and formula has been discontinued since this product has proved near impossible to find in recent months, but I originally received this in a makeup swap from a lovely girl in Portugal, and then received a backup at Christmas last year – when you love a product like this, you really do need backups just in case of emergency! I’ve since hit pan on this one, so it shows how much I use it. I dab a small amount on my E.L.F. blush brush (perfect size for these little pans) and blend it in with the other side. This shade suits my pale, cool-toned skin, giving a beautifully healthy yet natural look, and the formula wears all day without problems. I actually prefer cream blush in the warmer weather, since it looks pleasantly natural yet seems to hold up better than powder blush without wearing off. I’m so glad I have a backup of this gorgeous shade. I hope my June Favourites have inspired you! What products are you loving this month? La Roche Posay is one of my favourite skincare brands at the moment.